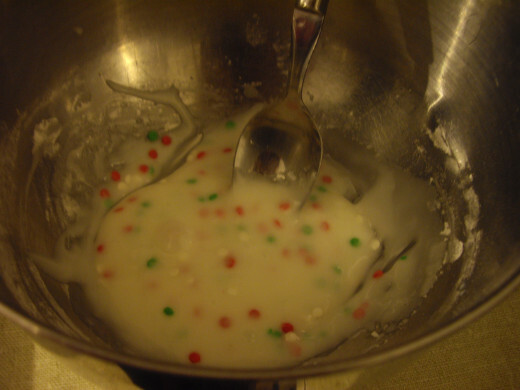 Funfetti is Pillsbury's name for the confetti candy sprinkles they have in many of their baking products. They seem to have new products with the name all of the time. 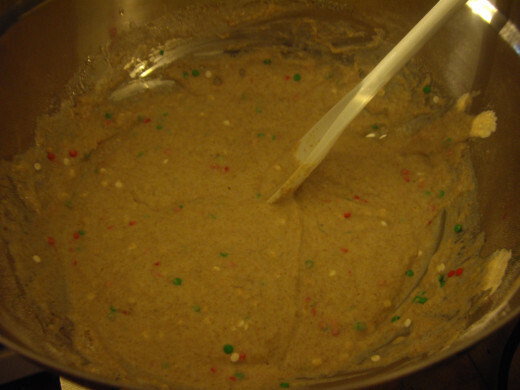 I have seen Funfetti baking mixes for cake, pancakes, and cookies, as well as a variety of frostings in many different colors. Pancakes are one of my favorite breakfast foods to make when I have a little extra time on my hands. 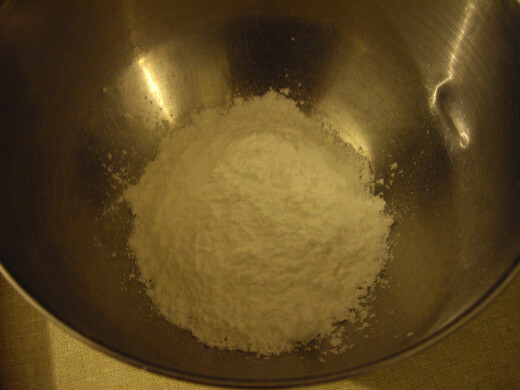 Even when I am short on time, it is quick to make if I whip up some of my baking mix in advance. One thing I enjoy about pancakes is that there are so many varieties to choose from, and so many things you can add to them or top them with to make them extra delicious. A few days ago I was inspired by the selection of baking mixes that are sold at the local store I work in part-time. 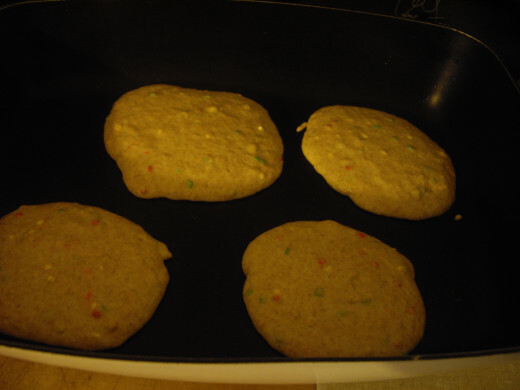 Since I am a fan of making my pancakes from scratch, I decided to try making my own variety of "Funfetti Pancakes". 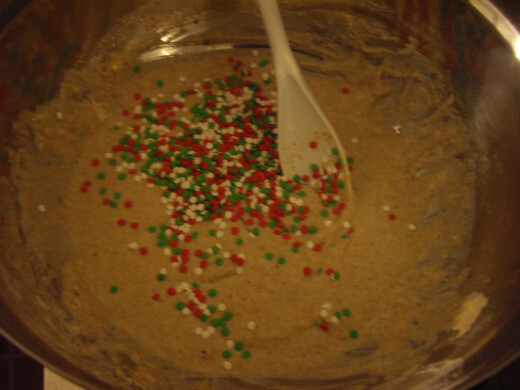 Making a baking mix for this is very easy. I like to make 6 cups of this at a time, which makes 3 regular sized batches of these. 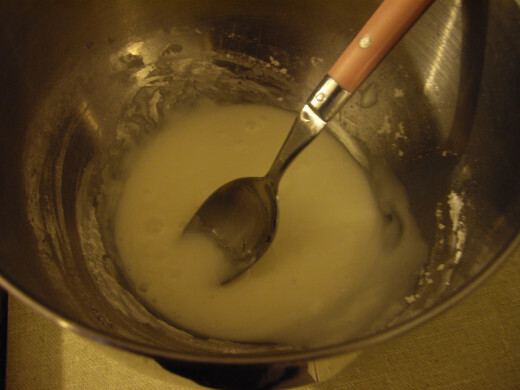 When the time comes to make a batch, just use 2 cups of this mix, and add the milk, egg, oil, and apple cider vinegar (if desired), and follow #4-7 of the directions above. Pancakes can be topped with so many different things. I think glazes work very well for these confetti pancakes, and there are so many types to choose from. This time I topped these with the Almond Glaze. It hit the spot, although it is incredibly sweet. 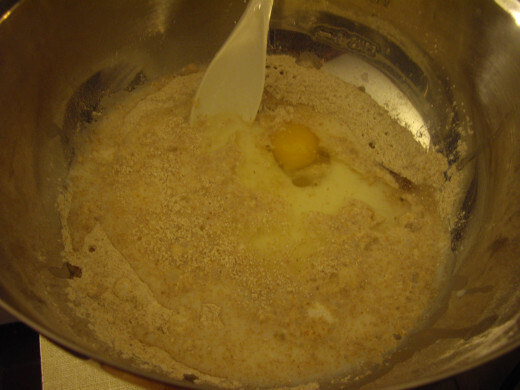 Mix the three ingredients together until smooth. To let it thicken, wait for 5 minutes. Mix the melted butter with the cocoa powder, powdered sugar and vanilla. 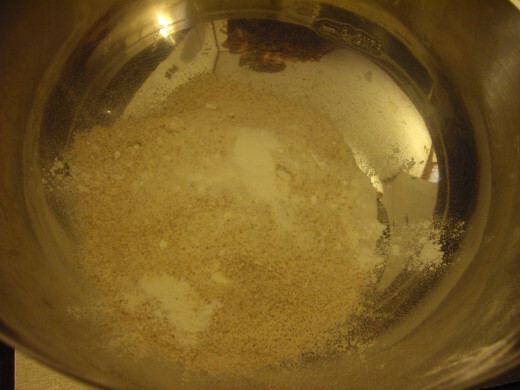 Gradually add water until it is the desired consistency. Sprinkles are made in a variety of shapes, colors and sizes, so it would be fun to make them based on whatever holiday or event is being celebrated. Try using the colors of your favorite sports teams on special championship or Super Bowl days. For an added pop of color, add a few drops of food coloring. Thanks, I think it is a pretty cool concept, and it's pretty good. Once in a while I like to experiment with dessert-like pancakes. Thanks for taking the time to comment, and have a lovely weekend. Rainbow confetti on pancakes! Definitely a cute idea. Thanks, I am glad you enjoy the picture. I like using my own photos for these articles, and it is fun to try to get it just right. This was such a fun pancake to make, and eating it made me feel like a kid again. Thanks for taking the time to read and comment, and have a fantastic day! That picture look so good I want to make these immediately. My goodness I feel like I can smell the food through the picture. Thanks, Audrey. I love pancakes, too, and was very excited when I thought of making them. So simple, and yet different from a basic pancake. You're welcome, and thank you so much for taking the time to read and comment on my pancake hub. Hi Kathryn - I am a pancake maniac. And now, after finding your confetti pancakes, I am in pancake heaven! I'm thrilled that you've been generous enough to share your recipe and can't wait to try it. Voted up, useful, awesome, interesting and sharing. 5* Hub! Indian Chef, I'm so glad you like the look of this recipe, and hope that if you try it, you like it. Thanks for voting it up and sharing, and have a wonderful weekend. 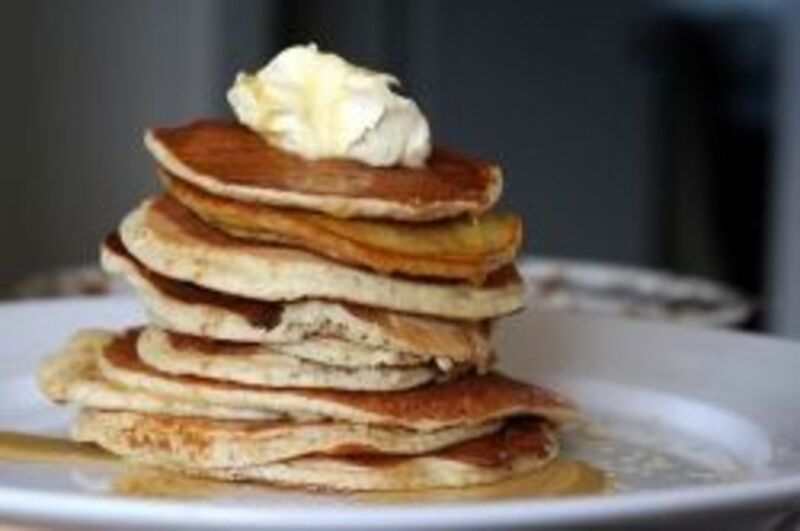 Kathryn, your pancakes just look delicious and surely going to try them soon. i have bookmarked it. Voting it up, awesome , 5 stars and shared on hubpages. I think it is delicious, and I hope that if you try it, you enjoy. Thanks for taking the time to read and comment, and have a wonderful day. Sound delicious, I'll give it a try! Happy New Year to you, too! Christmas with my family went very well, thanks. I'm so happy to be able to see them during the holidays now. The colorful sprinkles certainly do add a little bit of fun and pop of colors. It's a nice touch, I think, and sure to please kids. You're welcome, and thanks for taking the time to read, comment, vote and share. Have a wonderful day. Happy New Year Kathryn! I hope you had a wonderful Christmas with your family. Your pancake is so inviting and it is surely a good treat not only for me but for my nieces especially that it´s with colourful sprinkles. I´ll try this soon. Thanks for sharing. Voted up and shared. Take care. I know, I love pancakes! Sometimes a basic pancake is great, and other times I like something different. The glaze is great, although a little goes a long way. It is really sweet! It's funny, according to Facebook, several of my friends and family have had French toast in the past 24 hours. Thanks for taking the time to read and comment, and I hope you enjoy this when you try it. Have a great day! You're welcome. Mmmm, chocolate pancakes sound good, too. You're welcome, I thought it was a pretty cool twist myself! Thanks for taking the time to read and comment, and have a wonderful day! 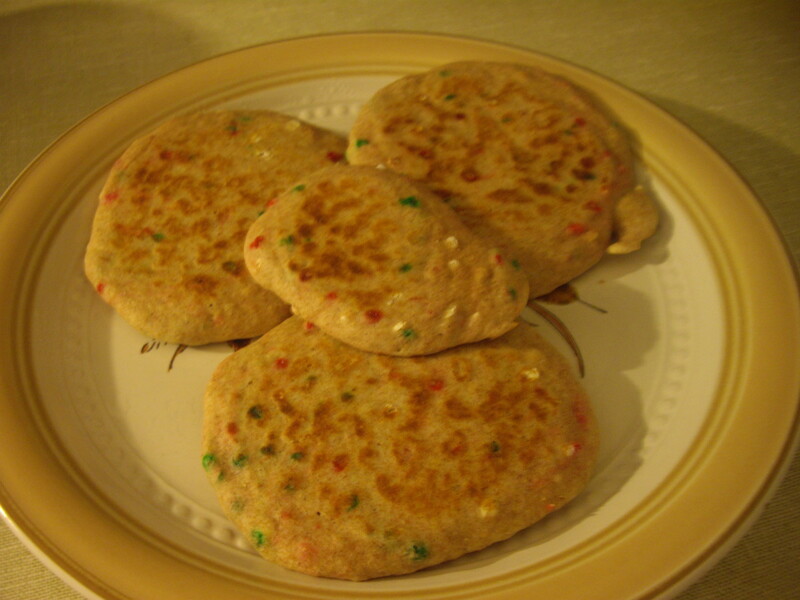 This is a great treat Kathryn, especially when grandkids are over to spend the night, what a treat I had never heard of confetti pancakes, the closest I came was to make chocolate pancakes. Thanks for the fresh new ideas. Hi Kathryn, this is sure to be a hit in my household. 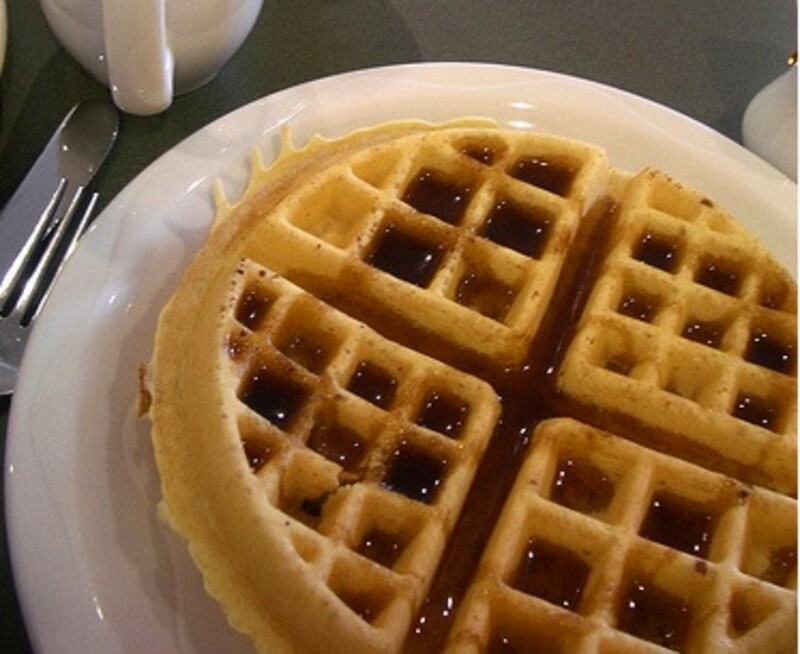 It's a unique twist to my kids favorite breakfast food. Thanks for the idea! Thanks, I'm glad you like. It was a fun hub for me to make, since I tested this recipe with the almond glaze. Tasty, although the glaze was almost too sweet for my own tastes. I am well, thank you! I am adjusting to life in CT, and I have seen my family and friends more in the past couple of months than I have in a long time. They are pretty yummy, although very sweet! Mmm, chocolate chip pancakes sound decadent. I never even think of adding chocolate chips. I think those would be great to munch on as a snack, too! Thanks for taking thetime to read and comment, and have a wonderful new year! It is very much like a confetti dessert! It's cool how just a few sprinkles can change the look of pancakes. I think it would be a great option for a birthday breakfast, and I think most kids would love it! You're welcome, and thanks for reading and commenting. It's nice to see you. I haven't been on here much lately, but I will check your page out soon. And your blog. I had never thought of confetti pancakes until I saw the commercial package in the store, but I think it's a neat iea. Most times I would be happy with just a basic pancake, but this version would be a great festive touch. Thanks, Janet, and I wish you the same. Happy new year! I will need to visit your page soon, since I haven't been reading as many hubs lately. 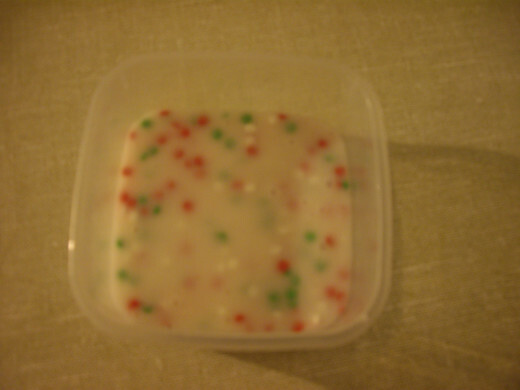 The sprinkles add such a colorful, festive touch, and they are inexpensive. Great combination! It does seem like something that kids would especially be taken to. Thanks for reading and commenting, and have a happy new year! I think they are pretty fun, thanks! You're welcome, and I hope this new year brings health and happiness your way. Thanks, I think they'd be a hit with kids. It would be a novel idea for adults, as well. Great option for adding a festive touch to a birthday or holiday. I agree! I don't have kids, either, but I think it would be a hit with young ones. Colorful and sweet, and the glaze and the sprinkles add such a colorful touch. Thanks, it is pretty yummy. And it was an interesting recipe t make for this hub. I am so sorry to hear about your father. That makes me sad. I can imagine how it must be hard to get back to writing with that kind of grief, and I hope it eases over time. I have been thinking about you a lot, and someone had mentioned that something happened to your father. Thanks for the pin and share, and for your comment. This pancake is a very festive option, and the glaze is incredibly sweet! I like creating these pancake hubs, and the option for the mixes. Simple and convenient. My holidays went well. I thought they would be a little lonely and sad, because change many times has that affect. But I have been able to visit with family several times over the past month and a half, and I have created my own traditions and fun to pass the time. I have also met a new man, who I have been getting to know over the past 7 weeks or so. I am getting used to living on my own, and look forward to what will happen this year. Thanks for taking the time to visit my page and comment. I miss you, and I hope things get better. Have a happy new year, Suzie. Another great idea full of options for variety that I love and definitely trying some out. I loved your baking mixes to have pre-prepared and makes pancakes so doable anytime. I lost my dad 5 weeks ago and only getting back slowly to writing, hope you had a lovely Christmas and the New Year brings you all you deserve. Pinned, shared thumbs up for this 5 star post! Thanks for reading and commenting, everyone! I will be back to respond to each of you individually as soon as I can! Have a happy new year! Another great recipe to save. 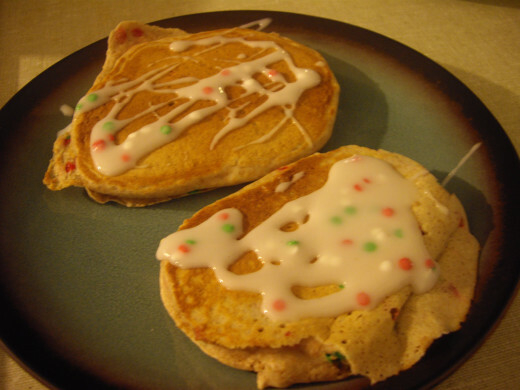 Confetti dessert as pancakes...why not? So simple and festive. This is such a fun recipe to make with kids on the weekends or for a spouse's birthday. Thanks for sharing! 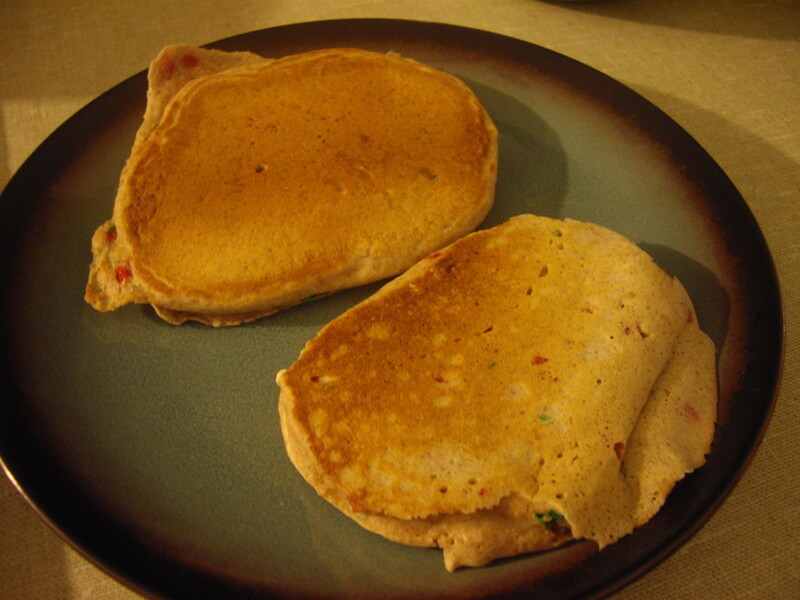 Confetti pancakes are absolutely new to me but I love the idea. I'm also a great pancake fan and I often try out new recipes. I love your recipes because you always provide varieties. Wishing you a happy, healthy and successful new year and I'm looking forward to reading more hubs. I think this must be the best breakfast for kids :-) Candy sprinkles are always a winner! Seasonal pancakes sound fun. Thank you for sharing. I bet these are a real hit with the kids! Cute idea, and I like the different glaze varieties. If I had children this would be the perfect breakfast for New Year's morning. The recipe is also great for those celebrating the night before and wake up hungry at noon! May you and your family have a beautiful, peaceful, New Year. I agree, birthday would be a great occasion for this. It's so festive! You're welcome, and thanks for taking the time to read and comment. Thanks, I'm glad you think this sounds good, and I appreciate the votes and share. Happy new year to you, too! I can barely believe it is coming upon us! These would make a wonderful treat for someone for a birthday breakfast! Thanks for the recipe! Oh, these really do look fun and delicious. I just love pancakes, so comforting. My grands would love these, and me too! Thanks, that is a sweet thing to say. I do like posting recipes, although I am enjoying the freedom to write whatever I want. This one took longer than I thought, but I like the way it came out. I am doing well, thanks. I am enjoying myself in Connecticut. I am working at the store I used to work in, so I am around familiar faces. I have kept in contact with friends, have visited with my family both of the last 2 holidays, am getting along well with my housemates, and I have even started seeing another man! So life is very good, although busy. Now that the holidays are nearly over, life will settle down a bit. Maybe I will write more often, but only time will tell. Thanks, I'm glad you think so. I enjoy coming up with ideas for pancakes, and this was a tasty experiment. I have only recently heard of confetti pancakes, and I thought it was such a cool concept. Thank you for taking the time to read and comment, and have a wonderful week. You ought to get a cookbook ebook going. You are great at this. The kids will love this, grownups too! I have never heard of confetti pancakes before.